This is a list of the best celebrity surprises from The Ellen DeGeneres Show. As the queen of daytime talk, Ellen DeGeneres delivers some of the funniest moments on television. One of the comedian and host's most popular segments during her top-rated talk show is the celeb scares. Some of the biggest names in Hollywood have fallen prey to Ellen and her staff's hilarious pranks, which often include popping out of nowhere and making the guests jump out of their seats. As simple as it looks on TV, the staff of Ellen take their pranking very seriously and have succeeded in scaring the pants off some of the most beautiful celebs, including Halle Berry, Jennifer Aniston, and Taylor Swift. The biggest surprises involving superstar guests of Ellen often become viral on the internet because audiences love watching celebrities react like "normal" people. No matter how famous or rich someone is, when a giant spider or a chainsaw-wielding freak unexpectedly comes up behind you, it's a natural reaction to scream and then realize how silly you looked, so you try to laugh off the embarrassment. Also included in the list are freak-outs from Megan Fox, Jim Parsons, and even Richard Simmons. Some of the most memorable moments of Ellen's popular series also happen when celebs surprise the host, other Hollywood stars, or even audience members. It's fun to watch an entire audience of adults freak out after Justin Timberlake makes an appearance on the show. Even Justin Bieber is part of Ellen history after popping into an elementary school classroom to meet his young fans. The sweet surprise proves the Biebs is capable of being more than just a top-notch jerk. 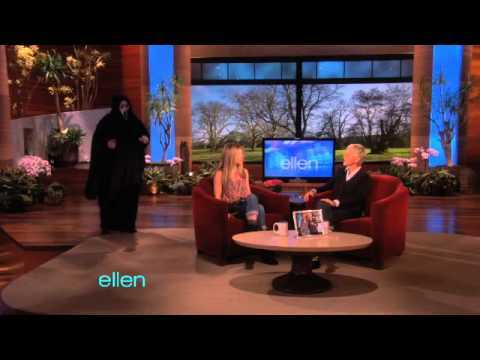 Enjoy the clips of the funniest and most awesome celebrity surprises from Ellen. Vote up for your favorites on the list and see how other Ranker members voted! The country superstar has no idea what Ellen has in store when she walks into her bathroom. Kristen Bell loves sloths. A LOT. Ellen Pompeo has the right to be nervous while being interviewed by Ellen. The masked killer from Scream takes on the Friends superstar.